What do you think of when you think of a drone? A quadcopter that your neighbor flies too close to your yard? A weaponized military system? A selfie drone? The word drone typically refers to an unmanned aerial vehicle (UAV), but it also now is used to refer to an unmanned underwater vehicle (UUV). Aerial drones are typically outfitted with cameras, but cameras are not always the best way to “see” underwater. Hydronephones are underwater vehicles, or underwater drones, equipped with hydrophones, or underwater microphones, which receive and record sound underwater. Sound is one of the best tools for sensing or “seeing” the underwater environment. Sound travels 4-5 times faster in the ocean than it does in air. The speed of sound depends on ocean temperature, salinity, and pressure. Sound can also travel far – hundreds of miles under the right conditions! – which makes sound an excellent tool for things like underwater communication, navigation, and even measuring oceanographic properties like temperature and currents. Here, the term hydronephone is used specifically to refer to an ocean glider, a subclass of UUV, used as an acoustic receiver [Figure 1]. 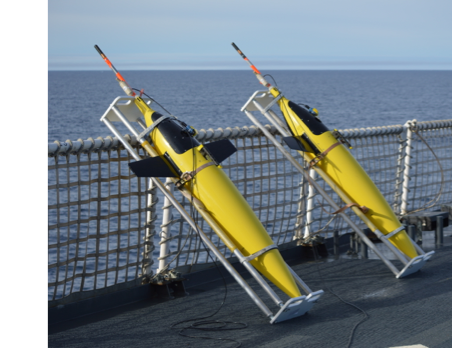 Gliders are autonomous underwater vehicles (AUVs) because they do not require constant piloting. A pilot can only communicate with a glider when it is at the sea surface; while it is underwater it travels autonomously. Gliders do not have propellers, but they move through the water by controlling their buoyancy and using hydrofoil wings to “glide” through the water. Key advantages of these vehicles are that they are relatively quiet, they have low power consumption so they can be deployed for long durations of time, they can operate in harsh environments, and they are much more cost-effective than traditional ship-based observational methods. Two hydronephones were deployed August-September of 2016 and 2017 in the Arctic Ocean. They recorded sound signals at ranges up to 480 kilometers (about 300 miles) from six underwater acoustic sources that were placed in the Arctic Ocean north of Alaska as part of a large-scale ocean acoustics experiment funded by the Office of Naval Research [Figure 2]. This acoustic system was designed to learn about how sound travels in the Arctic ocean where the temperatures and ice conditions are changing. The hydronephones were a mobile addition to this stationary system, allowing for measurements at many different locations. One of the challenges of using gliders is figuring our exactly where they are when they are underwater. When the gliders are at the surface, they can get their position in latitude and longitude using Global Positioning System (GPS) satellites, in a similar way to how a handheld GPS or a cellphone gets position. Gliders only have access to GPS when they come to the ocean surface because the GPS signals are electromagnetic waves, which do not travel far underwater. The gliders only come to the surface a few times a day and can travel several miles between surfacings, so a different method is needed to determine where they are while they are deep underwater. For the case of the Arctic experiment, the recordings of the acoustic transmissions from the six sources on the hydronephones could be used to position them underwater using sound in a way that is analogous to the way that GPS uses electromagnetic signals for positioning. Improvements in underwater positioning will make hydronephones an even more valuable tool for ocean acoustics and oceanography. As vehicle and battery technology improves and as data storage continues to become smaller and cheaper, hydronephones will also be able to record for longer periods of time allowing more extensive exploration of the underwater world. Figure 1: Seaglider hydronephones (SG196 and SG198) on the deck of the USCGC Healy prior to deployment in the Arctic Ocean north of Alaska in August 2016. 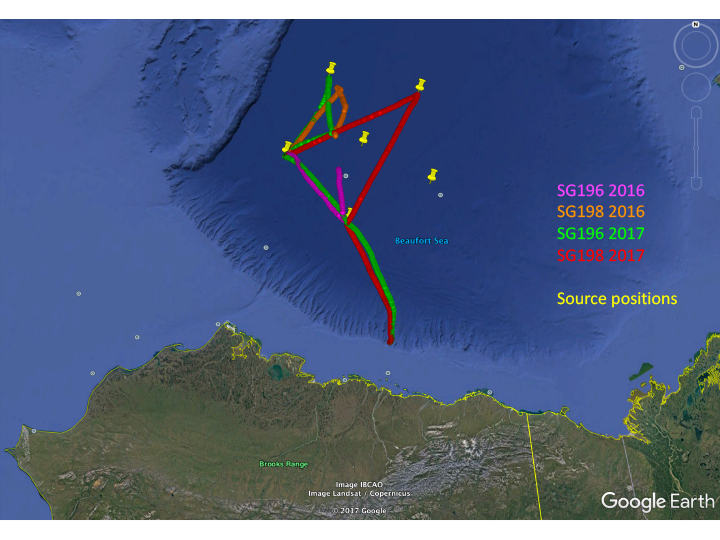 Figure 2: Map of Seaglider SG196 and SG198 tracks in the Arctic Ocean in August/September of 2016 and 2017. Locations of stationary sound sources are shown as yellow pins. Acknowledgments: Many investigators contributed to this experiment including Sarah Webster, Craig Lee, and Jason Gobat from the University of Washington, Peter Worcester and Matthew Dzieciuch from Scripps Institution of Oceanography, and Lee Freitag from the Woods Hole Oceanographic Institution. This project was funded by the Office of Naval Research.